2016 was my year of celebrity encounters. I attended two red carpet events and three fan conventions, which helped me to realize just how much I love the entertainment industry. I learned a few things, too, so I’d love to share with you my tips for what to do when you meet a famous person. Yep. 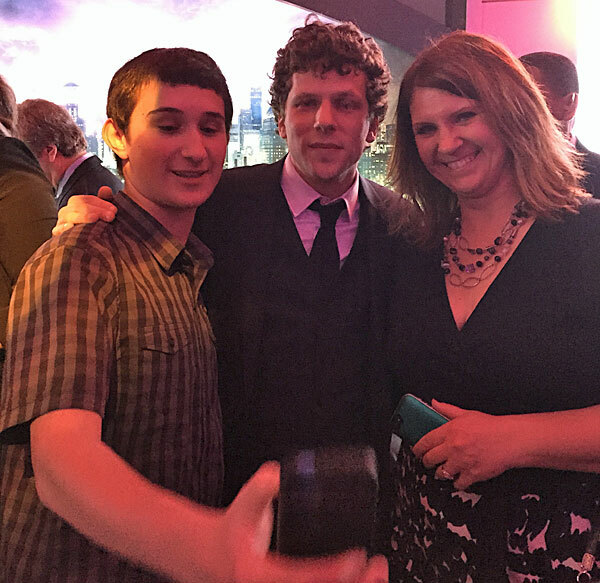 Totally took a selfie with Jesse Eisenberg. It all started last March when I was invited to attend the red carpet premier and afterparty in New York City for the movie Batman vs. Superman. Jeep was a sponsor of the movie and I went as their guest because I am a writer for SheBuysCars.com. I stood on the red carpet and took photos as the stars went by, and I enjoyed watching the movie premiere, but the best part was the afterparty. And I almost didn’t go. There was a light rain/snow coming down when I left the theater. I was concerned about driving home to New Jersey in bad weather if it got worse. I was ready to bail, but convinced myself to just check out the party – I could always leave if it wasn’t worth it. It was SO worth it. I met Robin Lord Taylor of Gotham, Neil deGrasse Tyson of Cosmos, and Jesse Eisenberg (squeee!!! ), who played Lex Luthor in the movie. All the stars of the movie were there. I rubbed elbows with Ben Affleck. Well, he brushed past me surrounded by security guards… but I count that as rubbing elbows. 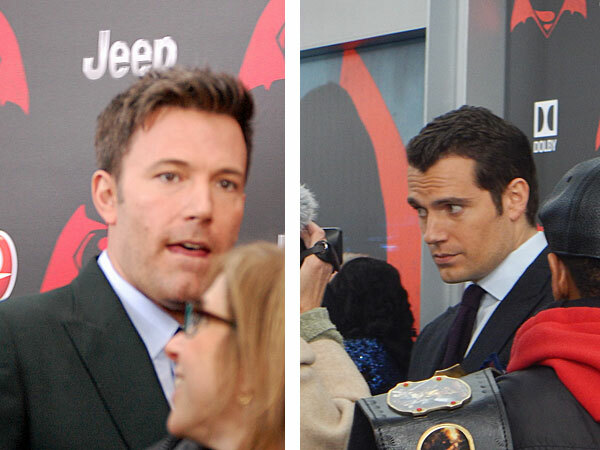 Ben Affleck (Batman) and Henry Cavill (Superman) are interviewed by the press. Lesson? Always go to the afterparty. You might be disappointed – like the party I attended after the American Music Awards that had zero celebrities in attendance and not even very good food – but you never know until you go. Speaking of the American Music Awards (AMAs), I was invited to be a Kohl’s VIP and attend the awards show last November as their guest. They hooked me up with professional hair and makeup services and stylists who gave me some awesome clothing (yes, I got to keep the clothes). All the Kohl’s VIPs got to attend the AMA dress rehearsal and watch the red carpet procession. It was one of the most fun weekends of my life. Not a lot of direct celebrity interaction, but I did meet Josh Dun of Twenty One Pilots in the hotel elevator. 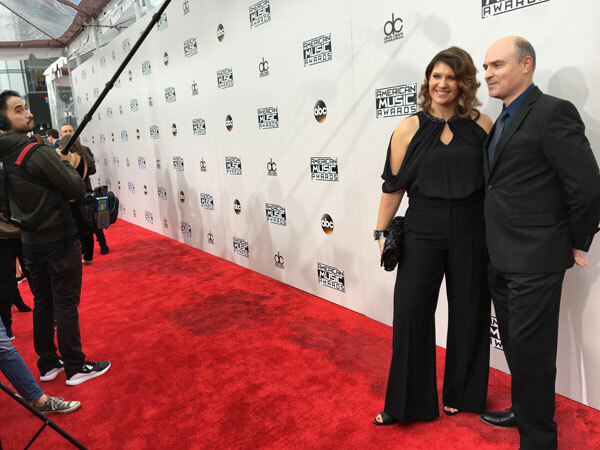 My husband and I on the red carpet before the American Music Awards, courtesy of Kohl’s. So what do you do when you meet a famous person? Be polite, respectful, and act like a fan. Celebrities know they are are celebrities. You don’t want to be insane (like the fan who actually BIT Norman Reedus of AMC’s The Walking Dead), but you don’t need to try to act all cool or like their peer either. The first time I met Norman Reedus, I tried to play it cool and attempted to ask him if there was a way I could contact his agent about interviewing him for my blog. Given that you only have about 15 seconds to talk, my pitch came out as some sort of incoherent babble. I’m pretty sure I made him confused and uncomfortable. I was mortified and pissed at myself. 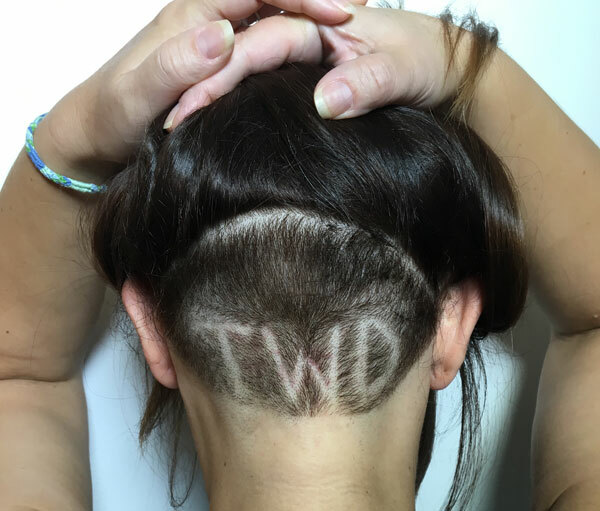 The second time I met him, I showed him the “TWD” I shaved into the back of my head and gave him a hug and it was AWESOME. This was a fun conversation piece at Walker Stalker Con. When I ran into Josh Dun of Twenty One Pilots in an elevator in Los Angeles, I didn’t say a word to him for the 9-floor ride down. As we got off the elevator, I politely asked if I could get a quick picture. That gave him the option to say no and he wasn’t trapped in the elevator (I know he’s a shy guy, so I didn’t want to make him squirm). He was gracious, clicked a quick pic, and then pretty much ran away. Again, if I tried to act like his peer and talk to him in the elevator, I’m pretty sure he’d have been uncomfortable. 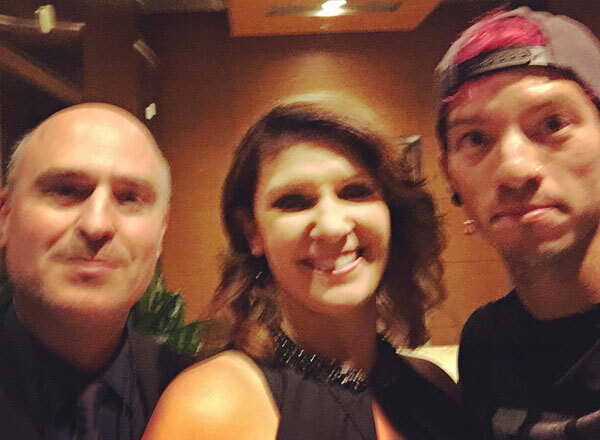 A quick, blurry selfie with Josh Dun of Twenty One Pilots. It’s OK to be a fan. Celebrities make their living off of their fans. Yes, some are jerks. But if they are attending a fan con, they know why they are there. What Do I Say to a Celebrity? Is it OK to Hug? If it’s a chance encounter, you don’t have a lot of time to think. Just be polite, say you are a fan, and ask for a photo or autograph if the person seems open to it. And if you see a famous person in a restaurant, don’t bug them when they are eating! If you are attending a fan convention, the stars are there to meet you. Think ahead of time about who you want to meet, what you want to say, and maybe if you want to bring them a gift. Lots of people bring artwork (I only wish I were that talented). If you’re looking for a hug, pay attention while you are in line. 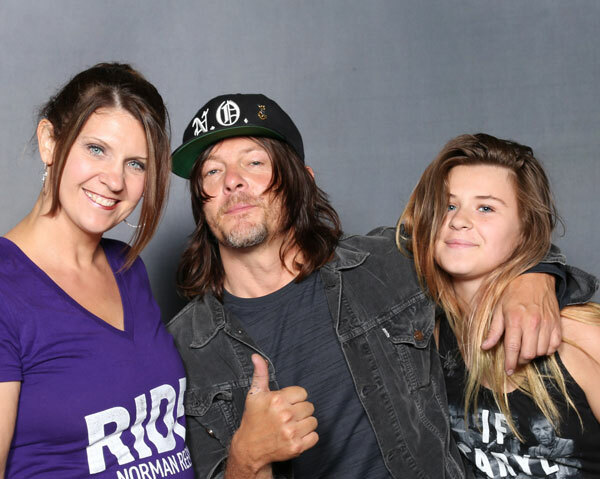 When I met Norman Reedus, he hugged every woman that came through his line – didn’t even ask, it was just a given. He said to me, “Get in here with your awesome shirt!” (I had on a T-shirt from his solo show Ride with Norman Reedus), and leaned over to hug me. Then he turned to my daughter and said “hey cutie” and gave her a hug. When we met Stephen Amell of the CW’s Arrow, he hugged only the women that asked. When we had a photo op with Jennifer Morrison of ABC’s Once Upon a Time, we were specifically told NO HUGGING. So it will depend on the celeb – pay attention and respect their wishes. When you decide to go to a fan convention, you have a lot of questions. Will it be crowded? How expensive will it be for photo ops and autographs? Do you have to buy these experiences ahead of time? Would everyone have access to the panels? I attended Heroes and Villians Fest, Walker Stalker Con, and Comic Con this past year. Every convention is basically the same – a vendor area where you can buy merchandise and artwork, rooms (or an area with seating) for panel discussions, autograph tables where you can meet the celebrities, and a photo op area where you take photos with the stars. Some also have interactive experiences – such as a zombie game or a jedi light saber training event. Those who purchase VIP-level tickets get first access in autograph and photo lines, and first seating for the panel discussions. At smaller cons, you can usually get a seat or stand nearby and still see and hear quite well. At Comic Con, you’ll be standing in line for up to an hour or more to get in to many panel discussions. If you want to have a photo taken with a celebrity, buy your photo ops online ahead of time. They often sell out – especially for high profile celebs. Prices for photo ops generally range from $50 – $150 dollars, which buys you a 5-second encounter with your favorite star and a professionally printed 8×10 photo. Prices vary according to celeb fame. Photo op with The Walking Dead’s Norman Reedus. If you don’t want to pay for a photo op, you can usually meet the celebs at their autograph tables. Autograph pricing ranges from $30 – $100. Some allow photos and selfies, some don’t – it’s strictly at their discretion and often dependent on the popularity of the celeb. A super popular star like Norman Reedus would never get to interact with as many fans as want to meet him if he took the time for photos at his autograph table. At Heroes & Villians Fest, the longest line I waited in was an hour. At Walker Stalker Con, I waited three hours to meet Norman Reedus. Again, you have to weigh just how much you want to talk to the celeb. For me, three hours was completely worth it. And Norman even made the wait fun. At one point, some girls that were not in line were screaming and trying to get Norman’s attention. He walked out from behind his table and started spraying them with Silly String. When we were nearly at the front, Norman suddenly walked out into the line with about 6 boxes of pizza and started handing them out to the people in line. That was SO awesome! And he was adorable with all the little kids that came to meet him – he would toss them candy into the crowd. Just as we were about 3 people away from the front of the line, he needed to take a 15 minute break, so he handed out chocolate bars and marshmallow peeps to the people in the front before he left. He’s such a sweet guy. Oh my, I kinda got off on a Norman tangent there. Bring cash! Because they need the lines to move quickly, the photo ops and autographs are cash only. If one of the more popular guests is in a panel, get in line for their table during the panel. You’ll be near the front of the line when he/she gets back to signing. Wear comfortable shoes – you’ll be standing ALL DAY. There is often no where to sit, even when you want to eat. Make sure you are in the right line. There are various levels of tickets sold to the event, such as Platinum, Gold, VIP, and general. There are lots of volunteers, so ask where you should be so you don’t waste time in the wrong line. This one is just my opinion, but if money is tight, choose autographs over photo ops. The photo ops move incredibly quickly – you can barely say “hi” to the celeb before they click the photo and usher you out. During autograph signings at tables, you can talk to them for a minute or so, and even bring them a small gift. A women in front of us in line brought Stephen Amell a bottle of wine that was named “Queen’s Gambit” (the name of the boat from the TV series) – VERY cool. I wanted to buy some from her. Some stars will allow photos or selfies (for additional money, of course) at their table. Don’t count on getting any pictures you can’t pay for. They are very strict about people taking photos just walking by the table or while waiting in line. They will kick you right out of line. I snuck a photo of Willa Holland (Arrow‘s Thea) while in line for her autograph, but got reprimanded when trying to take one while walking by another celeb table. If there is a table that is empty (it does happen near the end of the day! ), don’t be afraid to go up and talk to a celeb. They are people, too, and most enjoy meeting their fans. We had a wonderful experience chatting with Robbie Kay – my daughter’s favorite. He was incredibly sweet. DO take photos with the cosplay people. These are the ones who dress up and roam the convention floor. They will give you their business card and take a photo with you for free. And some of them are truly amazing. 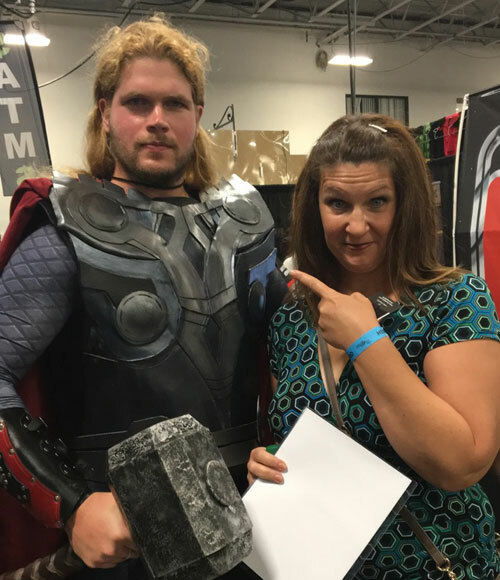 This “Thor” cosplayer handed me his card and said, “They say you should look me up on the Book of Faces.” Heh heh. I loved my experiences at Heroes & Villians FanFest and Walker Stalker Con. The crowds were manageable and the celebrities were happy to be there. The events were well-organized and extremely enjoyable. A larger event like Comic Con may be a disappointment if your sole reason for attending is to meet your favorite celebrity. Comic Con is awesome for the vendors and the artwork, as well as people watching – so many amazing costumes! But the photo ops, autographs, and panels can be a mob scene and you’ll spend a lot of time waiting in lines. I don’t know quite what it is about getting to meet a famous person that makes me happy. I’ve always had a fascination with the entertainment world and being able to talk to an actor – even briefly – and getting a peek at their personal side is something I really enjoy. It’s also exciting to meet other fans who I have something in common with. I’ve already got a few “fan con” plans in place for 2017. Stay tuned! Shannon, you have always been so good with meeting celebrities! Remember being in NYC and making me take a photo with dreadlocks guy? I STILL love that picture! Great tips! Yes – the guy from American Idol, right? I’m never afraid to just ask politely! Finally! A fellow celebrity stalker, er, gawker, er, whatever. I’ve been known to interrupt a meal but it was politely and while they were waiting for dessert! And I got a pic! Yes!! You are my people, Fadra. Great tips! I’ve never done this, but now I know how to act when I meet Norman Reedus. 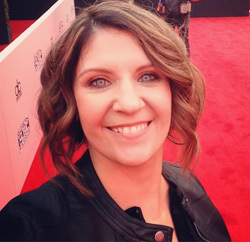 Also, you look AMAZING at the AMAs.